Take the Jones Falls Expressway (Rt 83) south to its end. Turn left on Fayette St and follow to Wolfe St. Turn right onto Wolfe St and follow to first traffic light, then turn left onto Baltimore St. Follow Baltimore St to second traffic light, and turn right on Chester St. Go one block to Lombard St.
Take Rt 95 south (stay left after passing the Beltway—Rt 695) to Rt 895. Follow Rt 895 to Moravia Rd (first exit on 895 and last exit before Harbor Tunnel). Turn left onto Moravia Rd and proceed to second right turn—Rt 40 (Pulaski Highway toward downtown—watch signs closely). Follow Rt 40 to Patterson Park Ave and turn left. Follow Patterson Park Ave for four blocks to Lombard St and turn right. Follow Lombard to Chester St (first traffic light). Take Rt 3 north to the Beltway (Rt 695). Take the Beltway west toward Towson, to Rt 295 (Baltimore-Washington Parkway) north. Follow Rt 295 north towards the Inner Harbor/Downtown (turns into Russell St) to Pratt St and turn right (one way). Follow Pratt St past Harborplace and Little Italy to Chester St (traffic light at intersection) and turn left. Take Chester St to Lombard St (first traffic light—one block). From the West via Beltway. Take the Beltway (Rt 695) south to Rt 295 (Baltimore-Washington Parkway) north. Follow Rt 295 north towards the Inner Harbor/Downtown (turns into Russell St) to Pratt St and turn right (one way). Follow Pratt St past Harborplace and Little Italy to Chester St (traffic light at intersection) and turn left. Take Chester St to Lombard St (first traffic light—one block). Take Rt 95 north to 395. (You may use Rt 695 (the Beltway) to access Rt 95.) Take Rt 395 towards downtown. Turn right onto Pratt St. Follow Pratt St past Harborplace and Little Italy to Chester St (traffic light at intersection) and turn left. Take Chester St to Lombard St (first traffic light—one block). 9:15 AM Hours; 9:30 AM Divine Liturgy. 6:00 PM Liturgy of the Presanctified Gifts followed by Lenten potluck dinner and talk. The Sacrament of Confession is heard before and after Great Vespers on Saturday. For other times, please call for a scheduled time. For Sacrament of Baptism and Chrismation, please call Father for scheduling of Pre-Baptismal and Chrismation Meeting. For Sacrament of Marriage, please call Father for scheduling of Pre-Marriage Meeting. A group of 30 families came together in 1940 and founded St Andrew’s parish under the leadership of Rev Fr Theodore Shevchuk within the jurisdiction of the Metropolia (now the Orthodox Church in America). 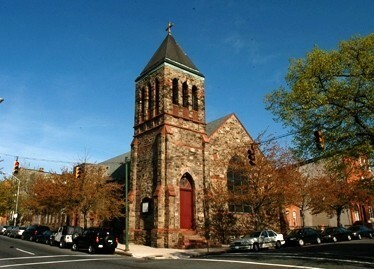 The parish worshipped temporarily at Fayette and Linwood Sts until a permanent building was found. The first Divine Liturgy was celebrated in the current building on Lombard and Chester Sts on Sunday, February 16, 1941. The Vladicon “R” Club (now the “O” Club) was founded in March of 1941, and the Sisterhood formed on May 1, 1941 with 11 founding members. The church building was consecrated on June 29, 1941 by Metropolitan Theophilus. The iconostas was dedicated in 1943, a school and choir were established, and the mortgage was liquidated by the end of the decade. A church cemetery was established in the 1940s but was moved in the early 1950s to its present location on German Hill Rd in Baltimore County. The church suffered a disastrous fire on Sunday, February 15, 1970, beginning just after Divine Liturgy had ended. The interior, floor, and roof of the church were destroyed, but fortunately no one was injured. One of the few items to survivie intact was an icon of St Andrew. The parish worshipped temporarily at a building on South Broadway from March 1970 to March 1972 while construction at the Chester and Lombard site took ploace. The reconstructed church and fellowship hall was consecrated in June 1972. The former church rectory, adjacent to the church, was renovated by parishioners in the early 1980s and was named the St Andrew Center. It currently houses the church school, pastor’s office and meeting rooms. The parish today serves Orthodox Christians from a variety of ethnic and religious backgrounds, living in Baltimore City and the surrounding metropolitan counties of Anne Arundel, Carroll, Baltimore and Harford. New members are warmly welcomed and inquiries from individuals wishing to learn more about the Orthodox Faith are always encouraged.